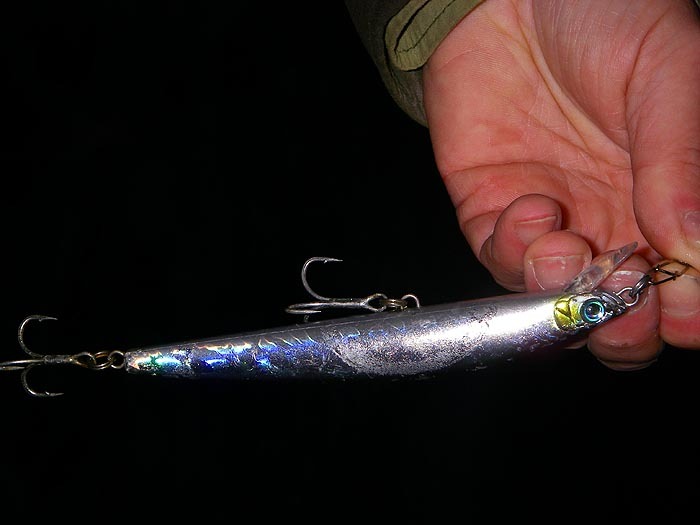 I've had a couple of morning sessions in the past week mainly to try out my latest lure - a Maria 'Fakebait'. On the first trip I met my new pal Rob and we walked some distance looking for bass. It was pretty slow to say the least. 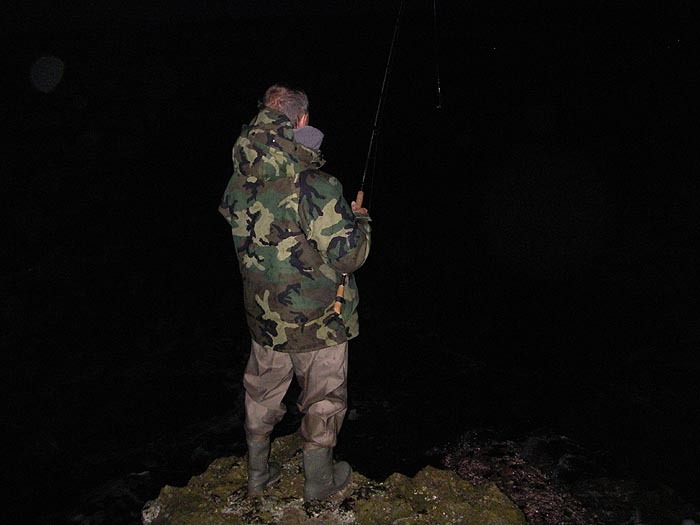 In fact I'd had a couple of schoolies before Rob arrived (still in the dark) and we each had another small fish just as it was getting light but after that - nothing! At least we saw nothing until we were making our way back. By now the tide was rising and in a couple of spots the blackheaded gulls were already squabbling over which maggot was the tastiest. We reached a very sheltered corner and Rob pointed out that there were one or two feeding mullet right in the edge. He had his fly rod with him so I suggested that he might give it a try. In fact Rob had no suitable flies and we hadn't brought any maggots so the chances were a bit slim. I rooted about in my bag and found an imitation poly-maggot fly. Rob tied on my creation and set to work. It was futile. In the good light and calm conditions the mullet were easily able to distinguish a biy of poly foam from a real wriggling maggot. Even though the fish were numerous they showed no interest. On one occasion Rob struck into a 'bite' and played a good mullet for a while. When it eventually came unstuck there were two big scales impaled on the size 10 hook - clearly this fish hadn't been fooled by the 'fly'. I left my pal to it and later heard that he hadn't managed to deceive a mullet - that's life! My next trip was with Dave Baker. 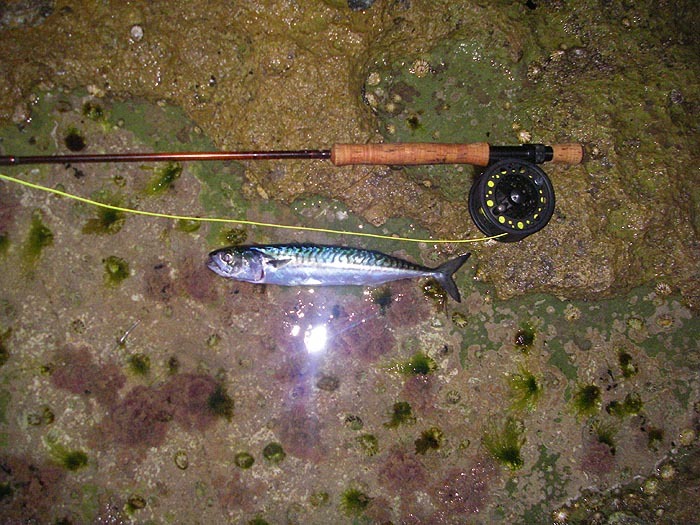 Dave had spent an evening fishing for bass with a float and a small Redgill, all he managed to catch was a couple of schoolies and despite the tonnes of maggoty weed on all the beaches he said that the fish did not turn up - bizarre! The following morning I met Dave on the rocks just after three o'clock (he's keen) and we flogged away with fly and plug for an hour or so. It was slow. Dave hooked an lost a good fish that took some line and plunged into the kelp (probably a decent pollack) and later on he hooked another fish on a wedge. 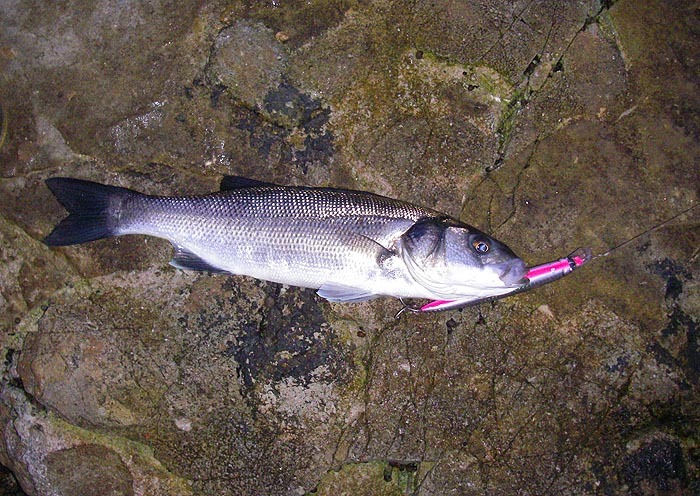 This one splashed on the surface (probably bass) and came unstuck on the way in - not Dave's morning. I fly fished for ages without so much as a sniff. 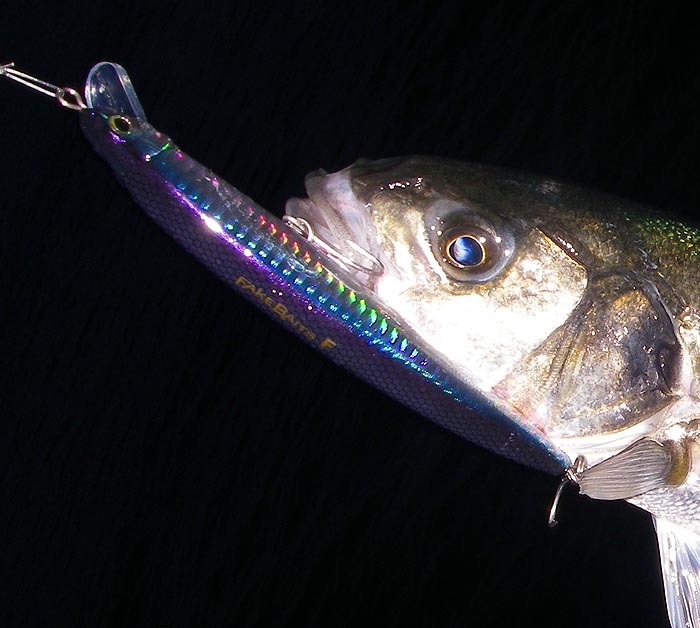 I changed to the new lure which is very much like a Chase or Angel Kiss with a nice holographic finish and a good action. After a while I managed to hook and land a small bass then that was it. I packed in and went home for breakfast leaving Dave, still as keen as ever, hard at it.